Take your pick of major outdoor attractions: Elk Island National Park, the Ukrainian Cultural Heritage Village, or Cooking LakeBlackfoot Recreation Area with over 170 km of summer and winter multi-use trails. 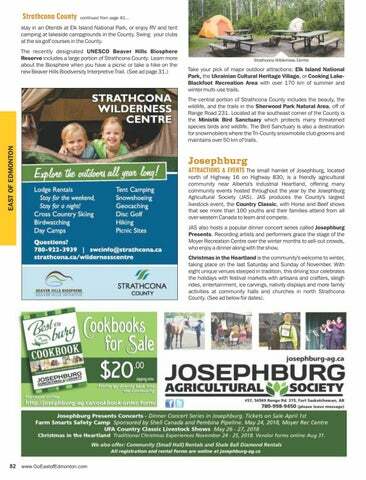 Josephburg ATTRACTIONS & EVENTS The small hamlet of Josephburg, located north of Highway 16 on Highway 830, is a friendly agricultural community near Alberta's Industrial Heartland, offering many community events hosted throughout the year by the Josephburg Agricultural Society (JAS). JAS produces the County's largest livestock event, the Country Classic, with Horse and Beef shows that see more than 100 youths and their families attend from all over western Canada to learn and compete. JAS also hosts a popular dinner concert series called Josephburg Presents. Recording artists and performers grace the stage of the Moyer Recreation Centre over the winter months to sell-out crowds, who enjoy a dinner along with the show. Christmas in the Heartland is the community's welcome to winter, taking place on the last Saturday and Sunday of November. 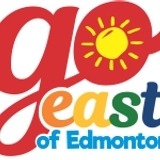 With eight unique venues steeped in tradition, this driving tour celebrates the holidays with festival markets with artisans and crafters, sleigh rides, entertainment, ice carvings, nativity displays and more family activities at community halls and churches in north Strathcona County. (See ad below for dates).